Mitigate your financial risk and ensure your procedures are billable, allowable & medically necessary. 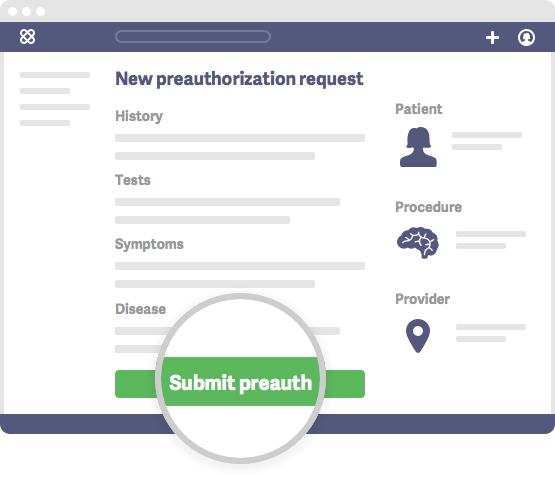 If anything requires Pre-Authorization, our system generates that as well. Next Health Choice compliments your EMR to streamline your workflows for all payers. Enter information through your online dashboard, no installation required. Your patients’ privacy is our primary concern. Contact our Chicago-based team via phone or email for immediate response. Next Health Choice offloads all administrative work required to verify coverage before various scheduled procedures including: imaging, surgery, physical therapy, durable medical equipment, pain management, and office distributed specialty pharmacy drugs. All information is clearly documented, creating a digital paper trail for your records and removing uncertainty and risk from your billing department. "My work load was immediately reduced as soon as I began to use Next Health Choice. Next Health Choice greatly benefits our company, improves office efficiency, and helps our associates focus more on patients. Within the first few days we saw a major shift in work load. I have peace of mind that one of my most important tasks will be taken care of. Next Health Choice has provided great customer service and communication every step of the way. " "This has reduced our overhead, increased our throughput, and allowed us to save time and money. It's a no-brainer to use Next Health Choice as it completely simplifies the entire benefits and eligibility verification process. We even were able to hold off hiring 2 new staff members for a fraction of the cost, simply by engaging Next Health Choice's Pre-Authorization service! 10/10 would recommend." "Next Health Choice represents a novel and important platform in the evolution of efficient, cost-effective service delivery in the complex environment of medical imaging. Ordering physician workflow benefits from the ability to rely on NHC to help guide the selection of the imaging venue. This is a significant benefit for both the healthcare consumer and providers."